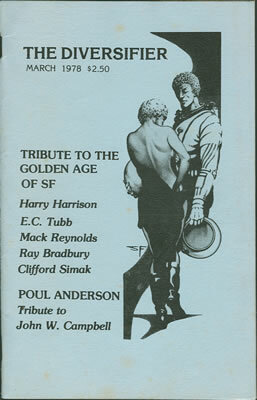 There’s been a lot of talk of late about the Golden Age of science fiction. I agree that the first science fiction stories that one read in one’s undiscriminatory youth made a big impression. My own initiation many, many years ago-was with THE TIME MACHINE, by H.G. Wells. Shortly thereafter I read everything by Wells that I could lay my hands upon. With the exception of TONO BUNGAY (which had science fictional elements) I find Wells’ non-science fiction - KIPPS, MR. POLLY &c - today quite unreadable. It dates dreadfully. His science fiction dates too - but not in the same way. Wells, the science fictioneer, made bad guesses (We’ve all made bad guesses.) He made good guesses. (Those sword-wielding samurai airmen in THE WAR IN THE AIR... The supercession of sea power by air power in the same book...) He made bad guesses. (The optimism of THE WORLD SET FREE, with a Golden Age as the main result of an atomic war.) For some reason he always shied away from rockets. Even as a boy of 14 1 just couldn’t see how his Cavorite (in THE FIRST MEN IN THE MOON) was supposed to work. A few years later I sneered at the Moon Gun, the firing of which peculiar piece of artillery was the climax of the film THINGS TO COME. Another science fictioneer - or fantasy monger - of the same period was Sir H. Rider Haggard. A book that sticks in my memory is QUEEN SHEBA'S RING. (QUEEN SHEBA'S RING, by Rider Haggard. . .Did he realise what he was doing when he gave the book that title?) Cutting a long and involved story short, there was a prophesy. When Harmack came to Mur the dynasty of this mythical African Kingdom, founded by the Queen of’ Sheba, would be given the bum’s rush. Mur was a city. Harmack was a huge, stone sphynx some miles outside the city. One of the European explorers finding this Lost Colony fell in love with the then reigning Queen of Sheba and decided to do the right thing by his girlfriend by making sure that Harmack never would come to Mur. African explorers in Rider Haggard’s novels always had a few tons of dynamite in their baggage - so what could he simpler than to blow Haemack to smithereens? There were convenient tunnels inside the big sphynx. The charge was planted. The hero lit the blue touch paper and retired to a safe distance. There was a Big Bang. The head of Harmack flew through the air with the greatest of ease and landed at one end of a hill, shaped like the body of a lion, inside the city of Mur. And that was the end of the Queen of Sheba’s dynasty. the lions turned red the island would sink beneath the sea. Three thieves made their way out to the island by night, taking with them a pot of red paint. They coloured the eyes of the stone lions. Early risers saw the warning sign and raised the alarm. There was a panic evacuation. And while the thieves were helping themselves to the abandoned treasures the island sank. I tried – and couldn’t read it either. And I couldn’t read today Burrough’s Martian novels, although I lapped then up when I was a kid. Garrett P. Service - THE SECOND DELUGE and quite a few others in the old AMAZING - I couldn’t read now, yet I can remember vividly Cosmo Versail’s Ark. E.Hyatt Versail’s, Lovecraft, Ray Cummings... All of them pulled aside the curtains of those magic casements fronting perilous seas - but, at the time that they wrote, there were very few writers in any field who could write worth a damn. There was an awful lot of crud published in those days. The Golden Age of Science Fiction? There was also a Golden Age of Spy Fiction - but E.Phillips Oppenheim and Sax Rohemr are today far outclassed by the le Carres, Deightons, O’Donnells &c and &c.
Essentially Golden Ages are subjective, not objective, phenomena. Very few of us would enjoy being transported by time machine back to the good old Days.